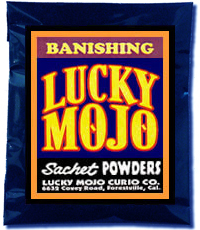 I've started wondering if the banishing sachet powder would be able to get rid of undesired and stubborn fat, toxins from your body, unhealthy food cravings, cellulite (I don't have any cellulite at all, lol, but almost all my friends and their sisters have them), acne, scars or whatever problem you have when you put some powder on your skin and accurately "program" them with your magical goals through visualization and concentration? Are you asking for advice on how to use the powders for the purpose of weight lose or?????????? I use Cast Off Evil combined in equal parts with Blessing for weight loss. There's no one way to do these things, though -- try Banishing for weight loss and see how it feels to you. You should try it and tell us how it works out. I've heard of Cast Off Evil being used to break habits of gluttony, over-eating and helps in weight loss. For blemishes and other "flaws" you might consider using Healing products to bring about health and the body's natural beauty. catherine: They seem to work well for me...I've lost 10 pounds in 3 days - no kidding! Thank you, cat!!! I'll have to try Healing products, ConjureMan, thanks for the tip!! Yes...which combination did you...are you using? How do you sprinkle banishing powder on someone who uses the same path as you walk on? Start walking a different path ! Spinkle it specifically where this person walks like right in front of their car, their door. be very intentional in the petition you pray so that it will only effect this specific person, mix some of their dirt (foot print in it as well) if cant do that burn a name paper and mix it with the powder and sprinkle. Go home after and wash yourself ( hyssop) and put on protection ( fiery wall) ( silver dime), to protect you from being effected by it. The only problem is its a private residence And we share the same client. Hoodoo is not a set of mechanical principles; it is a work of art. You quote in the name of the one you are working on as you sprinkle the Banishing Sachet Powder. That sets the work for that person. Virtually every form of domestic folk magic is built around practical principles like this. If something seems impossible or undoable, then you have made up extra "rules' that are outside the system. Hoodoo, like all folk magic, is simple, not overly complex. I have a plan and the first part of it is to get one person to quit his job. I want to sprinkle Banishment powder on a piece of paper and give it to him. The way I intend on doing it is to state my intention with his name and use a make-up brush to dust the powder on to the paper, away from me. Is that all? When cleaning up, I am going to take the excess powder and throw it in an intersection and clean my workspace with Chinese wash and myself with Hyssop. Please let me know if this is all I need to do or if I am missing anything. Thank you. Welcome to the forum. When you have a chance, and wish to do so, please introduce yourself in the Introductions thread. Your work sounds fine. If you want people to go away, you may also want to consider Hot Foot products. They do the job beautifully. If this doesn't work, I will definitely try Hot Foot. Thanks so much. Further to the helpful info and advice you have given to me i intend using the banishing powder to rid my unruly step children from my hone can i cleanse afterwoods with basil and protect myself with bay leaf? And what about my home and the rest of us that live there that i do not want affected how do i protect the redt of family and home? And separately hot foot kit inclusive of the golfer powder for that co worker from hell can I use the 13 herbal bath afterwords to protect myself. I am going to dust every part of her desk, floor area around and under her desk, phone computer the lot and finish off by sending a thank you card to her from someone she will not know but dust it with goofer powder. When using your Hot Foot Powder call the names of those you want affected. It should only affect those you have named and the rest of your family should be fine. If you can get the powder directly into the peoples shoes or socks so they are the only ones walking in it. You can use basil as part of a cleaning of yourself but I would go with more than just that herb. You might just use the 13 herb bath that you mention for all your cleaning needs in this instance. The bay leaf is perfect for protection yourself. Hot Foot does include gofer dust and there is usual enough product in a spell kit for more than one use so you can use it to deal with your co-worker and the 13 herb bath is a good idea here as well. Let us know how it all turns out! Thank you that's great I will keep you posted with how things are going. Can I put the banishing powder in food as the task of putting it in the shoes is becoming very tedious because never are the two out of the house at the same time the daughter does not leave unless she is going to college other times she is in her room, her belongings are all in her room the same goes for the son, if I go out their in, if I am in their are in. If I could sprinkle in food it would work a treat. I am going to buy the cook book that Miss Cat has. Thank you for your assistance much appreciated.